Some semantic domains may want to pass some additional information to print methods on a per-call basis. This base class provides something they can subclass to do that. A reference is passed to all print() methods for semantic objects. Definition at line 312 of file BaseSemantics2.h. The register dictionary which is used for printing register names. Indentation string appended to the line prefix for multi-level, multi-line outputs. Whether to show latest writer information for register and memory states. Whether to show register properties. Whether register initial values should be suppressed. If a register's value has a comment that is equal to the register name with "_0" appended, then that value is assumed to be the register's initial value. Definition at line 327 of file BaseSemantics2.h. Definition at line 328 of file BaseSemantics2.h. Definition at line 329 of file BaseSemantics2.h. The string to print at the start of each line. This only applies to objects that occupy more than one line. Definition at line 334 of file BaseSemantics2.h. Definition at line 335 of file BaseSemantics2.h. 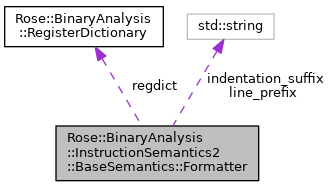 Referenced by Rose::BinaryAnalysis::InstructionSemantics2::BaseSemantics::RegisterState::print(), Rose::BinaryAnalysis::InstructionSemantics2::BaseSemantics::MemoryState::print(), and Rose::BinaryAnalysis::InstructionSemantics2::BaseSemantics::RiscOperators::print().